BAGHDAD (AP) -- Sunni militants have hung their black banners on watch towers at Iraq's largest oil refinery, a witness said Thursday, suggesting the vital facility had fallen to the insurgents holding vast territories across the country's north. A top Iraqi security official, however, said the government still holds the facility. The Iraqi witness who drove past the Beiji refinery, some 250 kilometers (155 miles) north of Baghdad, said militants also manned checkpoints around it. He said a huge fire in one of its tankers was raging at the time. The witness spoke on condition of anonymity because he feared reprisals. The security official in Baghdad said the government force protecting the refinery was still inside Thursday and that they were in regular contact with officials in Baghdad. He said helicopter gunships were flying over the facility to stop any advance by the militants of the Islamic State of Iraq and the Levant inside the refinery. He also said the militants took over a building just outside the refinery and were using it to fire at the government force. The official also spoke on condition of anonymity because he was not authorized to speak to journalists. The Beiji refinery accounts for a little more than a quarter of the country's entire refining capacity - all of which goes toward domestic consumption for things like gasoline, cooking oil and fuel for power stations. 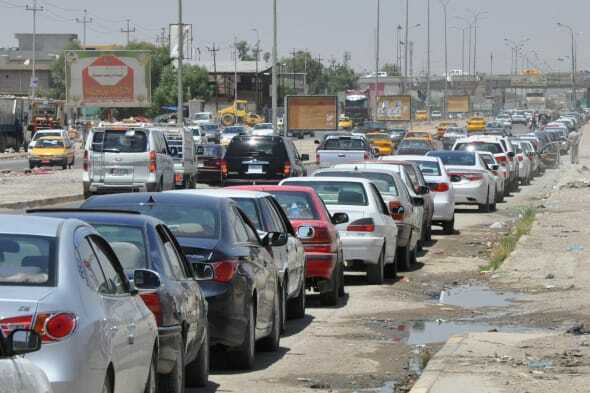 Any lengthy outage at Beiji risks long lines at the gas pump and electricity shortages, adding to the chaos already facing Iraq.